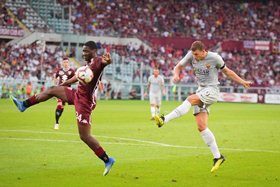 Nigeria international Ola Aina is still listed as doubtful to make his fourth appearance in the Italian topflight when Torino travel to William Troost-Ekong's Udinese in their first game after the international break. Italian sports daily La Gazzetta dello Sport says the injury update from Turin is not heartwarming as manager Walter Mazzarri, probably, will not be able to count on the services of the defender for the next game. On the same day that the Super Eagles claimed an easy 3-0 win over Seychelles in an Africa Cup of Nations qualifier, Aina was undergoing treatments and therefore is unlikely to recover. Center back William Troost-Ekong may be available for selection as he is showing signs of improvement after a muscle injury ruled him out of the trip to Seychelles. Nigeria coach Gernot Rohr will be monitoring with keen interest the physical condition of the two defenders as he has publicly stated that he will call up the pair for next month's crucial AFCON qualifier against Libya. Aina, a former England U19 skipper, became cap-tied to Nigeria after making his debut off the bench in a World Cup qualifier against Zambia in October 2017.